If you want to explore some hidden treasures in Wisconsin consider participating in the State Natural Areas Volunteer Program. Ginny Coburn is organizing volunteers on a regular basis to work with DNR Conservation Biologist and Wildlife Technician, Jared Urban, at uniquely beautiful locations in the South Kettle Moraine Forest just north and east of Whitewater. Back in May we girdled aspen at the Lone Tree Bluff Scenic Overlook and I visited the springs that originate Bluff Creek. Jared is a careful phenologist, optimizing every volunteer hour to the max. 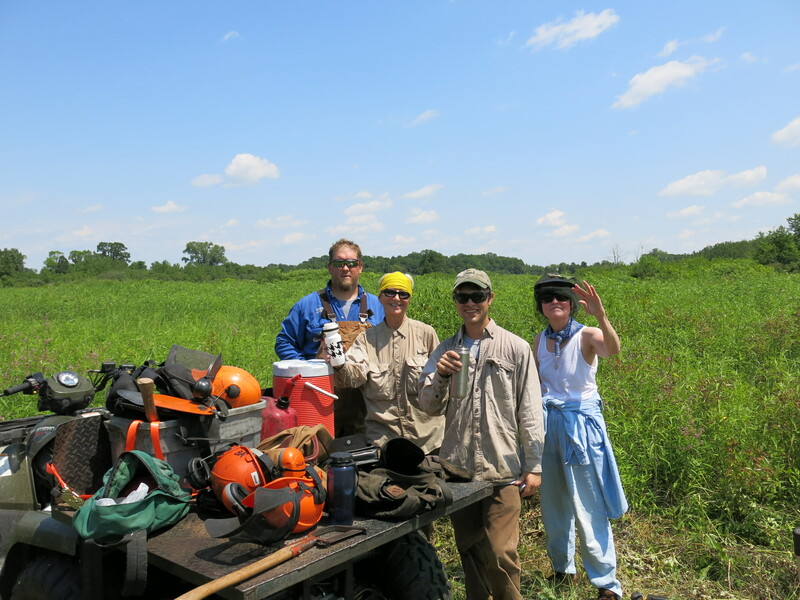 Last Saturday, July 20, our mission, dictated by dynamic biological phenomena, took us to the Bluff Creek “west” (of Hwy P that is) State Natural Area to a secluded prairie where we cut white sweet-clover and wild parsnip. I knew this was going to be good as I rode on the back of the 4-wheeler Jared was driving, holding down brush cutters and other gear, as we left the paved road behind us. 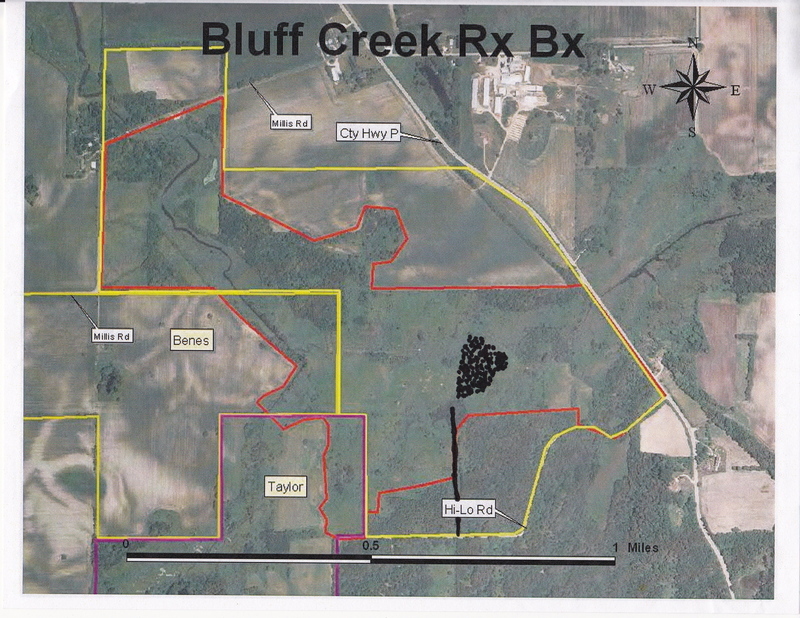 I think the black line coming north off of Hi-Lo Road approximates where we entered the prairie and the black dots show where we cut weeds. The view from on top the ATV. 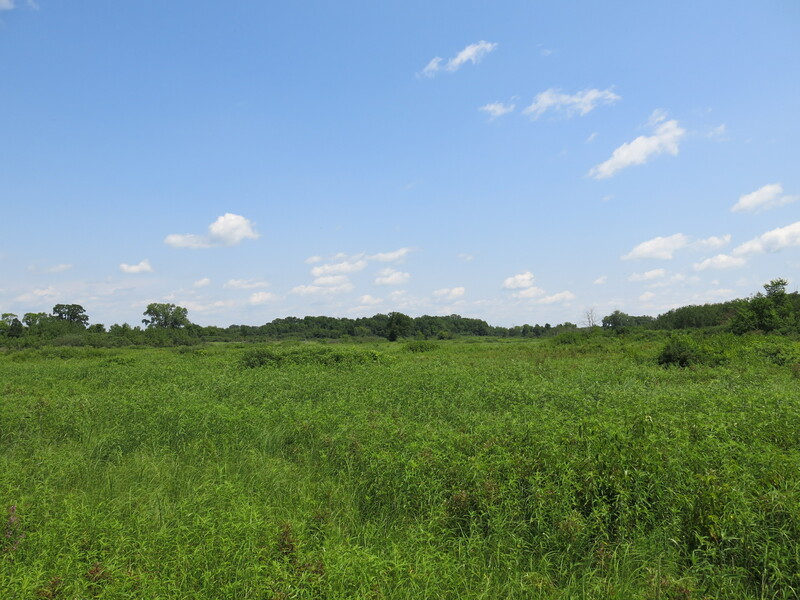 Jared explained how the DNR has been cutting brush and burning in this prairie for years and the results of their tender loving care were evident in the diversity of plants in this high quality prairie. Zach, Ginny, Jared, Diane and I had a wonderful morning doing what we love! I’m becoming a bit of a phenologist myself, or maybe its just hard not to notice the spotted knapweed and buckthorn resprouts/seedlings that are growing at phenomenal rates at The Springs. 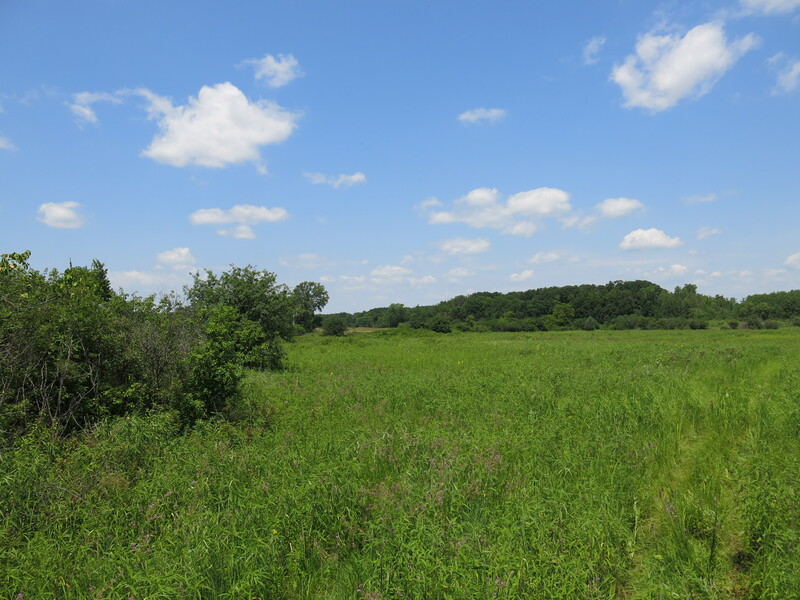 I had a few hours to spare before the Waukesha/Milwaukee chapter of the Ice Age Trail Alliance was to have their summer gathering, and I headed over to Scuppernong Springs Nature Trail. There were two trees down across the cut-off trail, and another down across the river just upstream from the gaging station. Sometimes trees grow faster than they can handle, and that appeared to be the case here. After cutting them out of the way, I started spraying weeds and brush seedlings on the cut-off trail. In many places both sides of the trail are literally carpets of new buckthorn and prickly ash seedlings. This is a perfect time to spray these plants as they are still small and there will be minimal collateral damage. This week I’m planning to cut spotted knapweed on the Sand Prairie and continue spraying buckthorn along the cut-off trail. This entry was posted in Kettle Moraine Oak Opening and tagged Kettle Moraine Oak Opening, Kettle Moraine State Forest, Kettle Moraine Trails, Sand Prairie, Scuppernong River, Scuppernong Springs, SouthEastern Wisconsin Hiking Trails by paulmozina. Bookmark the permalink.